Dialogue provides practical guidelines for one of the essential elements of true partnership--learning how to talk together in honest and effective ways. Reveals how problems between managers and employees, and between companies or divisions within a larger corporation, stem from an inability to conduct a successful dialogue. William Isaacs is the founder of Dialogos, a consulting firm based in Cambridge, Massachusetts. He is also a cofounder of the Organizational Learning Center at MIT and a senior lecturer at the Sloan School of Management. He is the author of Dialogue and the Art of Thinking Together. 5.0 out of 5 starsDialogue is something we use every single day but we never stop to think how it works. This was a very interesting book. I had to buy it for my Dialogue Class and I feel I learned a lot about how dialogue is created, shaped, and communicated. My professor said that less then 5% of the country studies and learns about dialogue which is very interesting because its something we do day in and day out. I have this book in hardback and wanted a kindle version. This is a great book for understanding the importance of really listening and communicating towards finding a workable resolution. It talks a lot about the value of empathy. I wish more folks would embrace this way of life. It's an easy read. This is the most powerful book that I've read in years. The depth of understanding on how to create powerful, meaningful conversations at work, home and in all relationships is here. We are in a society and environment where things are moving so fast that we have lost the patience and trust for carrying on meaningful conversations. Instead we have ping pong ball conversations that barely get below the surface to deep, common insight. Then we try to solve the problem without having agreement of what the problem is. 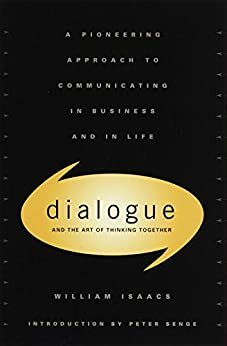 Read this book and understand this lost and important art of dialogue, the art of thinking together. This is a remarkable book that explains why I had failed over the years to reach satisfactory agreements with labour unions. For over a decade, I worked as an HR Manager and dealt with Labour Unions intensively to reach collective bargaining agreements that affected thousands of people. I wished I had known then the four principles and practices laid out in the book. It would have helped me carry out more dialogues and avoided me the pain of endless discussions, sterile debates and heated arguments in which I found myself throughout the years. A book that is written by a man full of experience in this field of knowledge. A book written in a language that is easy to understand and full of real life examples. This is a book that has inspired me to look more often inside myself to better assess the quality of my inner conversations before engaging myself with outer conversations. It is awash with wisdom and useful advice, but there is such an excess of information, that you might drown while searching for the highlights.